A low-class soldier that always stands at the frontline of battlegrounds. This is the standard soldier type with especially high vitality and hard armor. Besides a straight sword, they are equipped with a spear, thus broadening their battle style. Soldiers are a good choice for beginners who want an easier time getting used to melee combat. The Broad Sword and Short Spear complement each other fairly well; the sword can be used to fight multiple enemies or two-handed for extra damage, while the Short Spear is great for tight spaces. 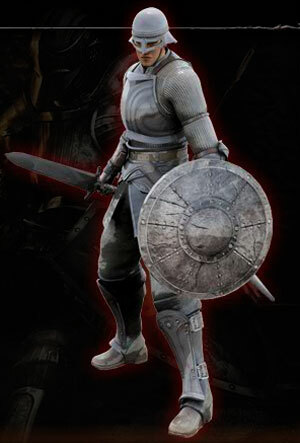 The Soldiers Shield is nothing special, though it can be quickly replaced, and the Plate Armor set provides high defense at the cost of mobility, though the high Vitality allows plenty of damage absorption. The Soldier is a well-balanced class overall.